One-third of children in the United States are overweight or obese. The prevalence of pediatric overweight and obesity has increased greatly since 1980, doubling in children aged 2 to 5 and tripling among those aged 6 to 11 and 12 to 19.1 The proportion of children affected by overweight and obesity is greatest among minority and underserved populations.2 As physicians may have limited nutrition expertise and time to counsel patients on obesity prevention and treatment, RDs should be actively involved as essential members of obesity management teams. Childhood obesity adversely affects the endocrine, cardiovascular, orthopedic, gastrointestinal, and pulmonary systems. It's associated with greater risk of CVD later in life. Two risk factors of CVD more common in obese children than in healthy-weight children are hypertension and elevated cholesterol. In one study, 70% of obese children had at least one CVD risk factor, and 39% had two or more.7 Other studies have shown increased risk of impaired glucose tolerance, insulin resistance, and type 2 diabetes.8 Childhood obesity also is associated with breathing problems, such as sleep apnea and asthma.9,10 Moreover, obese children are likely to develop joint problems and musculoskeletal discomfort.11 They're at greater risk of having fatty liver disease, gallstones, and gastroesophageal reflux (ie, heartburn).9,10 Many of these comorbidities that used to be considered "adult diseases" are now regularly seen in obese children. Secondary prevention strategies and interventions are more structured and directed at overweight and obese youth to help them achieve a healthier weight. Tertiary prevention interventions are the most intensive and comprehensive medical treatment programs for overweight and obese children and adolescents. These programs are conducted under medical supervision and are designed to resolve or decrease the severity of complications related to excess weight. RDs have a role at each level of prevention. There are several components of a comprehensive intervention program that have been shown to be successful at improving weight and health status in the long term. Effective programs should include changes in nutrition and physical activity along with behavioral therapy.20 Treatment for childhood obesity is based on a child's age and health status, but it usually includes implementing changes in the child's diet and physical activity level. In certain circumstances, treatment also may include medications or weight loss surgery. The RD's role in secondary and tertiary prevention interventions is to provide evidence-based recommendations to families of overweight and obese children and use behavioral therapy techniques to help families apply knowledge. The following section summarizes appropriate recommendations based on review of evidence. The following key messages are a sampling of the evidence-based guidance currently available to RDs. They're used in prevention and treatment. In counseling, these messages should be communicated to families in a way that's culturally appropriate and memorable. Messages should be presented in a manner that's sensitive to each individual family's socioeconomic status and psychological characteristics, and to the child's developmental stage.4 Each section provides examples or information that help RDs translate research data into guidance that's most likely to yield behavior change. Evidence suggests that a calorie-restricted diet may be effective for short- and long-term weight management in children aged 6 to 12 when implemented as part of a multicomponent program.6,7 This reduced-calorie diet should have fewer calories than required to maintain weight but not less than 1,200 kcal per day.25 Low-glycemic load diets show the most promise for management of pediatric obesity.26 Typically, a balanced macronutrient nutrition prescription is appropriate. A balanced macronutrient diet for children is defined by the Institute of Medicine's Dietary Reference Intakes as 45% to 65% calories from carbohydrates, 10% to 35% calories from protein, and 20% to 35% calories from fat. A "nutrition prescription" should be provided as part of the dietary intervention in a weight-management program for children. The prescribed calorie level and nutrient specifications often form the basis of the recommended eating plan and corresponding nutrition interventions, such as smaller portion sizes or increased intake of fruits and vegetables. Research shows that when an individualized "nutrition prescription" is included, improvements in weight status are more consistently observed among overweight children and teens than when the specific eating guidelines aren't provided. Therefore, RDs are encouraged to provide specific guidance to families by providing sample meal plans or meal patterns to structure daily eating with a calorie goal in mind. Sample meal plans and eating patterns are available at ChooseMyPlate.gov. Children are at greater risk of excess body fat when they consume a diet rich in high-energy density foods.27 High-energy density foods, commonly known as calorie-dense foods, are those that have a large number of calories in a small portion size. Examples of these foods are those high in fat and sugar such as pastries, cookies, crackers, chips, and sweets.28 These foods are common calorie sources in children's diets. The American Heart Association recently released guidance on consumption of added sugars. While adults are instructed to consume no more than 10% of their daily calories from added sugars, children are advised to consume no more than 25 g added sugars per day.38 This amounts to approximately six teaspoons. RDs should be prepared to teach families how to read food labels and provide examples of alternatives to foods and beverages high in added sugars. Over the past several decades, portion sizes of high-calorie, low-nutrient density foods and drinks sold in restaurants, grocery stores, and vending machines have increased. Evidence suggests that children eat more if they're served larger portions.39 This can mean they're consuming many extra calories without realizing it, especially when eating high-calorie foods. RDs should instruct parents to offer healthful foods in age-appropriate portions at meals and snacks and let the child decide how much to eat of what's offered. The American Academy of Pediatrics has developed a helpful chart suggesting appropriate portion sizes for children based on age.40 RDs can use this chart to educate parents on the appropriate serving sizes for children. 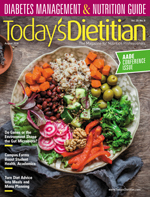 It's been shown that consuming high-energy density foods is associated with excessive calorie intake and overweight in children.41 Since fiber-rich foods tend to be lower in calories, it's likely that diets rich in fruits, vegetables, whole grains, beans, and nuts may be effective in preventing and treating obesity in children. High-fiber diets also may have a role in the prevention of CVD and type 2 diabetes, independent of their effect on weight management.42 Increased fruit and vegetable intake is associated with a decreased risk of childhood obesity.43 RDs can help by advising families about food shopping, meal planning, food preparation, and making healthful choices while eating out to maximize intake of fiber and nutritious foods. RDs can lead creative interventions such as grocery shopping tours, group nutrition classes, and cooking classes to show families how to introduce unfamiliar foods. In addition, RDs can advise families about strategies to overcome picky eating when introducing healthful food choices such as fruits and vegetables. Children, particularly adolescents, are at higher risk of obesity if they eat out frequently. This can be true if they eat at fast food restaurants often (more than twice per week). Furthermore, some evidence suggests that a greater degree of obesity results from eating fast food regularly year after year.45,46 RDs can help families devise a personalized plan to decrease fast food consumption and advise them on more healthful fast food and restaurant menu options. For example, if a family eats at a particular fast food chain often, an RD can print out a current list of menu items with less than 500 kcal for the family to reference. Alternatively, an RD can suggest quick and easy meals to prepare at home or identify strategies to add fresh produce to takeout meals to transition to eating meals prepared at home more often. In addition to encouraging children to reduce time spent in sedentary activities, RDs should encourage increases in both structured and nonstructured physical activity because time spent this way likely plays a role in preventing weight gain and associated health problems.50 On the other hand, physical inactivity puts school-age children at risk of obesity and insulin resistance.51 The USDA recommends children and adolescents participate in 60 minutes of moderate-intensity physical activity most days of the week, preferably daily.52 RDs can encourage parents to help children meet this activity goal by serving as role models and exercising together as a family. RDs should be able to provide information to families about community resources such as local parks, recreation centers, walking paths, family gyms, and sports leagues. If outdoor physical activity isn't a realistic option for families, indoor activities, such as exercising to videos, doing yoga, using hula hoops, dancing, or jumping rope, should be encouraged. Moreover, RDs should be realistic in setting goals for very obese or deconditioned children, who may need to start with lower-intensity exercise for shorter periods of time than the USDA-recommended 60 minutes. younger adults (18 to 25): 7 to 9 hours. It's clear from the evidence that the most effective treatment strategies for childhood obesity include changing dietary and physical activity habits; simply providing information about needed interventions, however, is ineffective.56 Lifestyle change resulting in weight loss must be facilitated through behavioral therapy, which commonly focuses on modifying and controlling the foods and opportunities for physical activity available to children. Stimulus control and regular self-monitoring of weight, eating, and physical activity have been shown to be effective behaviors for weight management.57 Stimulus control means restructuring the home to encourage healthful eating and activity behaviors and discourage unhealthful behaviors. Children benefit from family-based interventions, in which parents are actively involved in treatment. Whether parents are successful in controlling their own weight predicts the success their children will have in weight management.58 Therefore, parents should be taught to serve as role models for their children by monitoring and modifying their own eating and exercise habits. Behavior change in children often results from a system of consequences and rewards. Rewards appear to be particularly effective in encouraging children to achieve their goals. RDs can instruct parents to have a system for rewarding achievements such as losing weight, cutting back on portion sizes, increasing exercise, or decreasing screen time. Instead of using food rewards, ideal incentives promote healthful behavior.59 Nonfood rewards include new sports equipment, family hikes, bike rides, and swimming. Within various practice settings, RDs are encouraged to develop creative interventions to address childhood obesity. The behavior-centered design, a relatively novel approach to behavior change, suggests that behavior change messages are more effective when the intervention is creative and surprising.61 Many inexpensive and effective visual demonstrations come to mind, particularly for communicating the excess of sugar in children's diets. To educate families about the importance of reducing intake of sugar-sweetened beverages, don't simply state the risks associated with excess sugar. Instead, show a soda can alongside a clear sandwich bag containing 10 teaspoons of sugar to make the message more memorable and shocking. This image can be made even more impactful by creating a similar prop to illustrate the amount of sugar consumed over the course of a week or even a year by someone who drinks just one can of soda per day. In addition to the counseling RDs provide, effective pediatric weight management programs can be structured to last 12 weeks and include behavioral therapy sessions with a psychologist as a complement to diet and exercise education. Weight loss medications sometimes have a role in pediatric weight management. They're only prescribed to patients who haven't been successful in achieving a healthier weight with structured diet and lifestyle modification programs and have significant health risks associated with their weight. These patients must understand the limitations of pharmacotherapy and the need to make lifestyle changes in addition to taking weight loss medications. It's important for RDs to be aware of weight loss medications approved for use in children and teens and to appropriately counsel children and their parents stating that weight loss medication should be used only as part of weight loss therapy that includes diet, physical activity, and behavior modification.25 Obese children who may benefit from pharmacotherapy should be referred to a tertiary care center for evaluation and treatment. Currently, Orlistat is the only prescription weight loss medication in the United States that's approved for obesity treatment in adolescents aged 12 and older.6 It's not approved for use in children younger than 12. This medication blocks the absorption of fat in the intestine by inhibiting the enzyme lipase. It's been shown to be moderately effective in adolescents. Short-term weight loss of one year or less has been observed when orlistat was prescribed in conjunction with a weight loss program including diet, exercise, and behavior therapy.62 The use of orlistat is limited by unpleasant gastrointestinal symptoms, and its efficacy long term hasn't been thoroughly studied. Bariatric surgery is an increasingly common option for some obese teens, typically those with severe comorbidities who have failed to benefit from a more conservative medically supervised treatment for at least six months.6 While overweight and obesity in teens are defined by BMI percentiles, indication for bariatric surgery is determined by BMI index thresholds. The most recent guidelines by the American Society for Metabolic and Bariatric Surgery recommend the following BMI thresholds for obese adolescents to be eligible: BMI greater than 35 with serious comorbidity or BMI greater than 40 with less severe comorbidity. This recommendation is backed by evidence that bariatric surgery in teens has been shown to consistently confer sustained and clinically significant weight loss as well as resolution of comorbidities.65 Despite positive outcomes, it's important to note that complications sometimes do arise. At five-year follow up postsurgery, many teens still have BMIs over 35, vitamin D and B12 deficiency, iron-deficiency anemia, and surgical complications that have resulted in reoperation.66 The most common bariatric procedures performed on adolescents are Roux-en-Y gastric bypass, which resections the stomach to a small pouch that limits the amount of food that can be consumed in one sitting, and sleeve gastrectomy.67 Sleeve gastrectomy is less complex than Roux-en-Y and has a lower theoretical risk of micronutrient deficiencies, but it may be less effective long term.68 Its popularity has increased rapidly over the past decade, now accounting for 80% of bariatric surgical procedures in adolescents.69 RDs assist with preparing the family for lifestyle changes required with bariatric surgery and, along with a team of specialists, participate in long-term follow-up care of the metabolic and psychosocial needs of the patient and family. In most cases, the general goal for all ages is for BMI to trend downward until it's below the 85th percentile. Some children are healthy with BMI values between the 85th and 95th percentiles. If they have no additional cardiovascular risk factors at this BMI range, weight maintenance may be recommended. In the case of comorbid conditions and complications, resolution of these also is a goal.25 Once weight loss goals are met, it's imperative for RDs to continue assisting clients with a weight maintenance program.70 An optimal length of time between follow-up visits with RDs hasn't been established; therefore, RDs should work with families on a case-by-case basis to schedule timely assessments. A 2016 study reported that continuing to follow up with a dietitian was associated with greater improvements in BMI.71 Unfortunately, this study also stated that a majority of families don't seek continued support from a dietitian. Improving compliance with follow-up and dietary interventions is an important topic for further research. The childhood obesity epidemic is an urgent public health problem; therefore, RDs working in this field are encouraged to develop, implement, and evaluate creative interventions to contribute to the flourishing research on the prevention and treatment of childhood obesity. — Karolina Balkenbush, RDN, is program coordinator of the Healthy Hearts Program, a clinical-based, multicomponent pediatric obesity treatment program at the Children's Heart Center, a pediatric cardiology practice in Las Vegas. 1. Evaluate childhood overweight and obesity based on BMI percentiles. 2. Identify at least three risk factors for childhood obesity. 3. Distinguish at least three complications of childhood obesity. 4. Manage childhood obesity as part of a multidisciplinary team using evidence-based interventions. 1. Obesity in children is determined by which of the following? 2. Which of the following is a tertiary prevention intervention for childhood obesity? 3. What's the best way for parents to address a child's weight problem? a. Discuss the weight problem directly with the child. b. Restrict second helpings at meals. c. Teach the child to keep a detailed food log. d. Model healthful eating and exercise behaviors. 4. The best evidence exists for which of the following diet types for treating childhood obesity? 5. How much added sugar does the American Heart Association recommend for children aged 2 to 18? 6. What is the American Academy of Pediatrics' recommendation for screen time among school-aged children? 7. What level of activity does the USDA recommend for children and adolescents? a. Work up to at least 30 minutes of low-intensity physical activity daily. b. Work up to at least one hour of moderate-intensity physical activity most days of the week. c. Work up to at least 20 minutes of high-intensity physical activity daily. d. Work up to at least two hours of moderate-intensity physical activity several days per week. 8. At what age should childhood obesity prevention begin? 9. Which weight loss medication is approved for use in adolescents? 10. Which of the following is a key message for RDs to communicate to families as recommendations for their overweight children? a. Engage in time-restricted eating. c. Pack lunch for school. d. Avoid eating dinner after 5 PM. 2. Pan L, Blanck HM, Sherry B, Dalenius K, Grummer-Strawn LM. Trends in the prevalence of extreme obesity among US preschool-aged children living in low-income families, 1998-2010. JAMA. 2012;308(24):2563-2565. 3. Hansen AR, Duncan DT, Tarasenko YN, Yan F, Zhang J. Generational shift in parental perceptions of overweight among school-aged children. Pediatrics. 2014;134(3):481-488. 4. Daniels SR, Hassink SG; Committee on Nutrition. The role of the pediatrician in primary prevention of obesity. Pediatrics. 2015;136(1):e275-e292. 5. Childhood obesity causes & consequences. Centers for Disease Control and Prevention website. http://www.cdc.gov/obesity/childhood/causes.html. Updated December 15, 2016. 6. Hoelscher DM, Kirk S, Ritchie L, Cunningham-Sabo L; Academy Positions Committee. Position of the Academy of Nutrition and Dietetics: interventions for the prevention and treatment of pediatric overweight and obesity. J Acad Nutr Diet. 2013;113(10):1375-1394. 7. Freedman DS, Mei Z, Srinivasan SR, Berenson GS, Dietz WH. Cardiovascular risk factors and excess adiposity among overweight children and adolescents: the Bogalusa Heart Study. J Pediatr. 2007;150(1):12-17.e2. 8. Whitlock EP, Williams SB, Gold R, Smith PR, Shipman SA. Screening and interventions for childhood overweight: a summary of evidence for the US Preventive Services Task Force. Pediatrics. 2005;116(1):e125-e144. 9. Han JC, Lawlor DA, Kimm SY. Childhood obesity. Lancet. 2010;375(9727):1737-1748. 10. Sutherland ER. Obesity and asthma. Immunol Allergy Clin North Am. 2008;28(3):589-602, ix. 11. Taylor ED, Theim KR, Mirch MC, et al. Orthopedic complications of overweight in children and adolescents. Pediatrics. 2006;117(6):2167-2174. 12. Morrison KM, Shin S, Tarnopolsky M, Taylor VH. Association of depression & health related quality of life with body composition in children and youth with obesity. J Affect Disord. 2015;172:18-23. 13. Mustillo S, Worthman C, Erkanli A, Keeler G, Angold A, Costello EJ. Obesity and psychiatric disorder: developmental trajectories. Pediatrics. 2003;111(4 Pt 1):851-859. 14. Halfon N, Larson K, Slusser W. Associations between obesity and comorbid mental health, developmental, and physical health conditions in a nationally representative sample of US children aged 10 to 17. Acad Pediatr. 2013;13(1):6-13. 15. Schwimmer JB, Burwinkle TM, Varni JW. Health-related quality of life of severely obese children and adolescents. JAMA. 2003;289(14):1813-1819. 16. Taylor VH, Forhan M, Vigod SN, McIntyre RD, Morrison KM. The impact of obesity on quality of life. Best Pract Res Clin Endocrinol Metab. 2013;27(2):139-146. 17. Freedman DS, Dietz WH, Srinivasan SR, Berenson GS. Risk factors and adult body mass index among overweight children: the Bogalusa Heart Study. Pediatrics. 2009;123(3):750-757. 18. Biro FM, Wien M. Childhood obesity and adult morbidities. Am J Clin Nutr. 2010;91(5):1499S-1505S. 19. Resnicow K. School-based obesity prevention. Population versus high-risk interventions. Ann N Y Acad Sci. 1993;699:154-166. 20. Speiser PW, Rudolf MC, Anhalt H, et al. Childhood obesity. J Clin Endocrinol Metab. 2005;90(3):1871-1887. 21. Taveras EM, Rifas-Shiman SL, Scanlon KS, Grummer-Strawn LM, Sherry B, Gillman MW. To what extent is the protective effect of breastfeeding on future overweight explained by decreased maternal feeding restriction? Pediatrics. 2006;118(6):2341-2348. 22. Owen CG, Martin RM, Whincup PH, Smith GD, Cook DG. Effect of infant feeding on the risk of obesity across the life course: a quantitative review of published evidence. Pediatrics. 2005;115(5):1367-1377. 23. Mennella JA, Jagnow CP, Beauchamp GK. Prenatal and postnatal flavor learning by human infants. Pediatrics. 2001;107(6):E88. 24. Bider-Canfield Z, Martinez MP, Wang X, et al. Maternal obesity, gestational diabetes, breastfeeding and childhood overweight at age 2 years. Pediatr Obes. 2017;12(2):171-178. 25. Spear BA, Barlow SE, Ervin C et al. Recommendations for treatment of child and adolescent overweight and obesity. Pediatrics. 2007;120(Suppl 4):S254-S288. 26. Spieth LE, Harnish JD, Lenders CM, et al. A low-glycemic index diet in the treatment of pediatric obesity. Arch Pediatr Adolesc Med. 2000;154(9):947-951. 27. Johnson L, Mander AP, Jones LR, Emmett PM, Jebb SA. Energy-dense, low-fiber, high-fat dietary pattern is associated with increased fatness in childhood. Am J Clin Nutr. 2008;87(4):846-854. 28. Francis LA, Lee Y, Birch LL. Parental weight status and girls' television viewing, snacking, and body mass indexes. Obes Res. 2003;11(1):143-151. 29. Reedy J, Krebs-Smith SM. Dietary sources of energy, solid fats, and added sugars among children and adolescents in the United States. J Am Diet Assoc. 2010;110(10):1477-1484. 30. Vartanian LR, Schwartz MB, Brownell KD. Effects of soft drink consumption on nutrition and health: a systematic review and meta-analysis. Am J Public Health. 2007;97(4):667-675. 31. Wang YC, Bleich SN, Gortmaker SL. Increasing caloric contribution from sugar-sweetened beverages and 100% fruit juices among US children and adolescents, 1988-2004. Pediatrics. 2008;121(6):e1604-e1614. 32. Ebbeling CB, Feldman HA, Osganian SK, Chomitz VR, Ellenbogen SJ, Ludwig DS. Effects of decreasing sugar-sweetened beverage consumption on body weight in adolescents: a randomized, controlled pilot study. Pediatrics. 2006;117(3):673-680. 33. Feeding the child. In: American Academy of Pediatrics. Pediatric Nutrition. 7th ed. Elk Grove Village, IL: American Academy of Pediatrics; 2014:143-173. 34. Striegel-Moore RH, Thompson D, Affenito SG, et al. Correlates of beverage intake in adolescent girls: the National Heart, Lung, and Blood Institute Growth and Health Study. J Pediatr. 2006;148(2):183-187. 35. Newby PK, Peterson KE, Berkey CS, Leppert J, Willett WC, Colditz GA. Beverage consumption is not associated with changes in weight and body mass index among low-income preschool children in North Dakota. J Am Diet Assoc. 2004;104(7):1086-1094. 36. Berkey CS, Rockett HR, Field AE, Gillman MW, Colditz GA. Sugar-added beverages and adolescent weight change. Obes Res. 2004;12(5):778-788. 37. Suez J, Korem T, Zeevi D, et al. Artificial sweeteners induce glucose intolerance by altering the gut microbiota. Nature. 2014;514(7521):181-186. 38. Vos MB, Kaar JL, Welsh JA, et al. Added sugars and cardiovascular disease risk in children: a scientific statement from the American Heart Association. Circulation. 2017;135(19):e1017-e1034. 39. Orlet Fisher J, Rolls BJ, Birch LL. Children's bite size and intake of an entrée are greater with large portions than with age-appropriate or self-selected portions. Am J Clin Nutr. 2003;77(5):1164-1170. 40. Toddler — food and feeding. American Academy of Pediatrics website. https://www.aap.org/en-us/advocacy-and-policy/aap-health-initiatives/HALF-Implementation-Guide/Age-Specific-Content/Pages/Toddler-Food-and-Feeding.aspx#none. Accessed September 30, 2015. 41. Kral TV, Rolls BJ. Energy density and portion size: their independent and combined effects on energy intake. Physiol Behav. 2004;82(1):131-138. 42. Mente A, de Koning L, Shannon HS, Anand SS. A systematic review of the evidence supporting a causal link between dietary factors and coronary heart disease. Arch Intern Med. 2009;169(7):659-669. 43. Nicklas TA, Yang SJ, Baranowski T, Zakeri I, Berenson G. Eating patterns and obesity in children. The Bogalusa Heart Study. Am J Prev Med. 2003;25(1):9-16. 44. Szajewska H, Ruszczynski M. Systematic review demonstrating that breakfast consumption influences body weight outcomes in children and adolescents in Europe. Crit Rev Food Sci Nutr. 2010;50(2):113-119. 45. Taveras EM, Berkey CS, Rifas-Shiman SL, et al. Association of consumption of fried food away from home with body mass index and diet quality in older children and adolescents. Pediatrics. 2005;116(4):e518-e524. 46. Fraser LK, Clarke GP, Cade JE, Edwards KL. Fast food and obesity: a spatial analysis in a large United Kingdom population of children aged 13-15. Am J Prev Med. 2012;42(5):e77-e85. 47. Strasburger VC, Jordan AB, Donnerstein E. Health effects of media on children and adolescents. Pediatrics. 2010;125(4):756-767. 48. Council on Communications and Media. Media use in school-aged children and adolescents. Pediatrics. 2016;138(5). 49. Epstein LH, Valoski AM, Vara LS, et al. Effects of decreasing sedentary behavior and increasing activity on weight change in obese children. Health Psychol. 1995;14(2):109-115. 50. Berkey CS, Rockett HR, Gillman MW, Colditz GA. One-year changes in activity and in inactivity among 10- to 15-year-old boys and girls: relationship to change in body mass index. Pediatrics. 2003;111(4 Pt 1):836-843. 51. Andersen RE, Crespo CJ, Bartlett SJ, Cheskin LJ, Pratt M. Relationship of physical activity and television watching with body weight and level of fatness among children: results from the Third National Health and Nutrition Examination Survey. JAMA. 1998;279(12):938-942. 52. US Department of Health and Human Services. 2008 physical activity guidelines for Americans: be active, healthy, and happy. https://health.gov/paguidelines/pdf/paguide.pdf. Published October 2008. 53. Pileggi C, Lotito F, Bianco A, Nobile CG, Pavia M. Relationship between chronic short sleep duration and childhood body mass index: a school-based cross sectional study. PLoS One. 2013;8(6):e66680. 54. Durmer JS, Dinges DF. Neurocognitive consequences of sleep deprivation. Semin Neurol. 2005;25(1):117-129. 55. Hirshkowitz M, Whiton K, Albert SM, et al. National Sleep Foundation's sleep time duration recommendations: methodology and results summary. Sleep Health. 2015;1(1):40-43. 56. Herrera EA, Johnston CA, Steele RG. A comparison of cognitive and behavioral treatments for pediatric obesity. Child Health Care. 2004;33(2):151-167. 57. Young KM, Northern JJ, Lister KM, Drummond JA, O'Brien WH. A meta-analysis of family-behavioral weight-loss treatments for children. Clin Psychol Rev. 2007;27(2):240-249. 58. Wrotniak BH, Epstein LH, Paluch RA, Roemmich JN. Parent weight change as a predictor of child weight change in family-based behavioral obesity treatment. Arch Pediatr Adolesc Med. 2004;158(4):342-347. 59. Dietz WH, Robinson TN. Clinical practice. Overweight children and adolescents. N Engl J Med. 2005;352(20):2100-2109. 60. Eliakim A, Friedland O, Kowen G, Wolach B, Nemet D. Parental obesity and higher pre-intervention BMI reduce the likelihood of a multidisciplinary childhood obesity program to succeed — a clinical observation. J Pediatr Endocrinol Metab. 2004;17(8):1055-1061. 61. Augner R, Curtis V. Behaviour Centered Design: towards an applied science of behavior change. Health Psychol Rev. 2016;10(4):425-446. 62. Ozkan B, Bereket A, Turan S, Keskin S. Addition of orlistat to conventional treatment in adolescents with severe obesity. Eur J Pediatr. 2004;163(12):738-741. 63. Crocker MK, Yanovski JA. Pediatric obesity: etiology and treatment. Pediatr Clin North Am. 2011;58(5):1217-1240, xi. 64. McDonagh MS, Selph S, Ozpinar A, Foley C. Systematic review of the benefits and risks of metformin in treating obesity in children aged 18 years and younger. JAMA Pediatr. 2014;168(2):178-184. 65. Bondada S, Jen HC, Deugarte DA. Outcomes of bariatric surgery in adolescents. Curr Opin Pediatr. 2011;23(5):552-556. 66. Inge TH, Jenkins TM, Xanthakos SA, et al. Long-term outcomes of bariatric surgery in adolescents with severe obesity (FABS-5+): a prospective follow-up analysis. Lancet Diabetes Endocrinol. 2017;5(3):165-173. 67. Reames BN, Finks JF, Bacal D, Carlin AM, Dimick JB. Changes in bariatric surgery procedure use in Michigan, 2006-2013. JAMA. 2014;312(9):959-961. 68. Clinical Issues Committee of the American Society for Metabolic and Bariatric Surgery. Updated position statement on sleeve gastrectomy as a bariatric procedure. Surg Obes Relat Dis. 2010;6(1):1-5. 69. Paulus GF, de Vaan LE, Verdam FJ, et al. Bariatric surgery in morbidly obese adolescents: a systematic review and meta-analysis. Obes Surg. 2015;25(5):860-878. 70. Barlow SE; Expert Committee. Expert committee recommendations regarding the prevention, assessment, and treatment of child and adolescent overweight and obesity: summary report. Pediatrics. 2007;120(Suppl 4):S164-S192. 71. Hampl SE, Borner KB, Dean KM, et al. Patient attendance and outcomes in a structured weight management program. J Pediatr. 2016;176:30-35. 72. Epstein LH, Valoski A, Wing RR, McCurley J. Ten-year outcomes of behavioral family-based treatment for childhood obesity. Health Psychol. 1994;13(5):373-383.